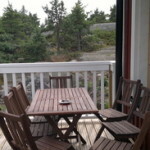 The Villa is the heart and center of the Hamnholm island, on the eastern side of the island, where we also have our small marina. 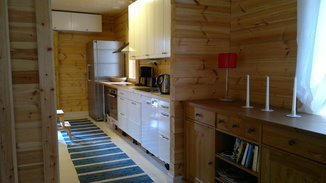 The house includes the big hut/living room, a bedroom, two lofts, kitchen, shower room and own sauna. 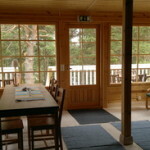 The hut is huge and gives you the possibility to enjoy the archipelago while sitting comfortable inside – the porch with all the windows gives you a feeling of being part of the nature. One of the lofts – TV-loft – has Tv, Xbox 360 Kinetic (can also be used as DVD-player), sofabed and two arm chairs. Sleeping arrangements: The bedroom downstairs has two beds, and room to accomodate more people on the thick mattresses provided to you. “The TV-loft” has sofabed or two, and two additional beds. “The sleeping loft” has two beds, sofabed and room for additional mattresses. 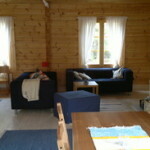 The Villa offers very comfortable sleeping for 8 people, and can accomodate even 12. The Villa is fully equipped for your comfort, and offers washing machine, tumble-dryer, dishwasher, fully equipped kitchen with coffee maker that grinds your beans, WLAN for your laptop, and even Xbox for the rainy days. On the two terraces you have tables and chairs to enjoy the meals outside, and a barbecue to also prepare them outdoors. If the cooking does not sound like your ideal holiday activity every day , ask for our catering services. 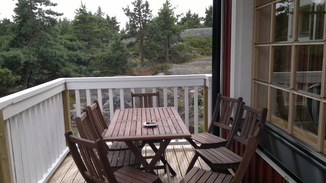 One week’s rental includes two sauna times at the Seaside Sauna. For additional sauna times and hot tub usage ask for additional information. Despite all the luxuries the Villa – like all the buildings on Hamnholm – is built ecologically and to endure tens and hundreds of years. The Villa is surrounded by delicate nature and to be able to enjoy this environment even longer, we ask you to respect the nature and to do your bit – do not leave anything after you, and leave the environment as it was when you came. 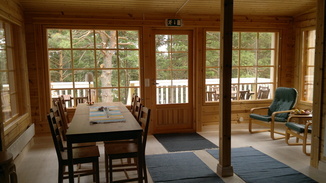 As all our Hamnholm cottages, also the Villa has outdoor bio-toilet. To be able to save our beautiful archipelago we also ask you to use water and elctricity sparingly, use eco-programs in washing machine and dish washer, as well as utilize the compost we have at the guests’ disposal. 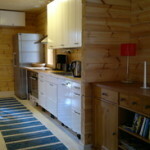 The water used in the cottages is cleaned ecologically without chemicals. Ask for an offer for you family, company or other group – in a weekend or a week at Hamnholm you can really have a break from everyday life and time for each other! 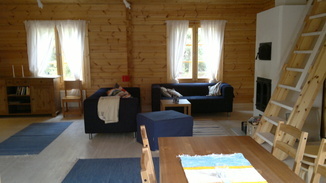 Unwind in the big hut/living room by the fireplace. On the terrace you can enjoy your meals being part of the nature.